On 10 May 1931, Sifu Chiu Leun was born in Toi Saan County, Fau Sek Village in Lane Number Five, in the neighborhood of Luhng Pihng. Toi Saan is the same part of Gwangdung Province– not far from Hong Kong– where, until the 60’s and 70’s, the vast majority of Chinese people who ended up in the United Statesoriginated from. His father had already been to theU.S.to join other brothers in the family and he returned to Toi Saan to find a wife. Because his father was already an American citizen, even though he was born in China, Chiu Luen was considered to be an American also, so, later, when he wanted to emigrate to the States, he was issued a U.S. passport and was able to travel easily back and forth to China his whole life. When he was about six years old – this was 1937, he was playing in the fields as usual and he saw a baby bird hopping around, trying to learn how to fly. Its movements attracted him and he followed the bird into the woods. There he met two other children – a boy and a girl – about his own age and began to play with them. After some time, an older man – the children’s uncle and a Buddhist monk, joined them and they continued playing as before. After a while, the young Chiu Leun wanted to go home but was unable to find his way so the monk helped get him home. The monk and the boy and girl were from northern China. The rest of the children’s family had all been killed and the three of them had escaped to the south. Their father had been the monk’s brother. They were living in the woods, collecting and selling medicinal herbs to support themselves. They also learned Chinese Gung Fu. The monk was practicing to be able to return to the north and fight the people who had killed his family. A day or two later, the monk returned to Chiu Leun’s home and talked to his mother, saying that her son had a kind of affinity – a sort of uncanny connection – with him and his niece and nephew. The idea was that if she accepted the idea, Chiu Leun, her son, would leave her home and go to live with the monk and the two children. It must be born in mind that, in addition to the fact that China in the 1930’s was a fairly lawless and dangerous place, this was the time that the Japanese – already occupying much of the north – were pushing south to extend their control. Ports were closed. It was impossible for all but the richest and luckiest to leave. Getting money from America was impossible. The opportunity for a small child to go into apprenticeship – tutelage, really – with a monk was not to be dismissed lightly. After returning one or two times, Chiu Leun’s mother agreed to have her son go and follow the monk and his two small charges. One of his jobs would be to help as an interpreter and guide the three northerners as they went. In exchange, he would learn the science of Chinese medicine – - particularly what is called ‘ Diht Da’, treating injuries to the bones, ligaments, tendons and muscles and Tohng Lohng Kyuhn (the Praying Mantis style of Chinese martial arts). They all lived in the woods, collected herbs and traveled to different parts of Gwangdung and the surrounding areas selling herbs, liniments and other medicinal preparations. All the time Chiu Leun was learning more and more Gung Fu; learning how to fight with his hands and traditional weapons. He was with the monk and his older gung fu brother and younger gung fu sister (si-hing and si-muih) for around ten years; until about 1947. The Japanese were gone but the was civil war in China between the Nationalists and the Communist armies. The older monk resolved to return to the north to take revenge for his brothers family. He told Chiu Leun and his niece and nephew – all three of whom knew Tohng Lohng Kyuhn very, very well by this point – to go to Hong Kong to look up another of his students; their younger gung fu uncle. They did this and Chiu discovered later that both his sifu, the monk and the enemy that had killed his family had died in the fight they had fought. After going to Hong Kong, Chiu Leun and the others had not yet found his younger gung fu uncle when he did meet his blood relation and uncle, Chiu Chi-Man. Chiu Chi-Man was also a gung fu sifu and taught Northern Eagle Claw (Ying Jaau Faan Ji Muhn) and (Wu Style) Taai Gihk Kyuhn (Tai Ji Quan) as well as Chat Sing Tohng Long, at the Hong Kong Jing Mou Association. The Jing Mou in Hong Kong had invited Law Gwong-Yuk to come from Shanghai a number of years earlier and Chiu Leun’s uncle Chiu Chi-Man had learned a great deal of the same style that Chiu Leun himself had spent over two-thirds of his young life studying and perfecting. Sifu Chiu Leun told a story about attacking his uncle unawares once and being thrown and hurt severely because the older man did not know it was his nephew who was attacking him. Chiu Leun learned with his uncle for about five years and always spoke of him with the greatest regard and respect. During this time he helped his uncle teach in the Jing Mou Association. The association occupied the sixth floor of a building and in a building opposite, on a lower floor, there was another martial arts school. This was owned by Bahk Mou Chiu (‘White Haired’ Chiu) the famous master of Hung Fat Paai. Chiu Leun took to watching the classes and, over time, picked up the entire Hung Fat style. Later, he invited Sifu Bahk Mou Chiu out and, to show his respect and admiration, demonstrated what he had picked up, respectfully requesting corrections in his performance. Chiu Leun’s understanding of Chinese Gung Fu was so deep and broad that even a very different type of style had few mysteries for him. All this time, he kept in contact with his older gung fu brother and younger gung fu sister fromChina. After he had been with his uncle for some five or so years, the girl determined to enter a Buddhist convent. Chiu Leun had finally located his younger gung fu uncle; the one his sifu had told him to look for in Hong Kong. Since his younger gung fu sister, whom he had known virtually his entire life had decided to turn her back on the world, he also entered a temple with the younger gung fu uncle where he spent the next ten years practicing Tohng Lohng Kyuhn; from about 1952 to about 1962. At that point, he re-entered society and traveled around, making a living with the Chinese herbology he knew so well and practicing Chinese Gung Fu – both attract clients and to protect himself. Much of rural China today is “untamed” in some senses. In 1966, Sifu Chiu Leun immigrated toNew York. Within the first year or so, he worked as a security guard of sorts. Soon, he opened the first Gung Fu School in New York’s Little Italy. In those days,China town was much smaller and there were very few Chinese businesses above Canal Street. His first school was on Elizabeth between Broome and Grand Streets. After a year, he moved to166 Mott Street one block away where he taught until 1984. After that, he only taught ‘closed door’ students. For his entire professional teaching life, Sifu Chiu Leun never once advertised for students. 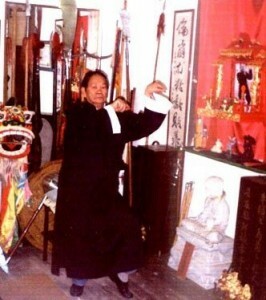 His reputation as an extraordinary practitioner of Chinese martial arts – in particular, Chat Sing Tohng Lohng Kyuhn has never been and, unfortunately is never likely to be equaled. On Sunday, 15 January 2006, at 3:30 pm Sifu Chiu Cheung Leun passed to his next life in Beth Israel Hospital in New York City. He is survived by his two sons, Hing-Wah and Sing-Wah and two daughters, Siu-Bun and Man-Nei. He will be sorely missed.